Beach Palace ioffers three inviting pools including two spectacular rooftop pools with stunning views, big water slide, activities, and entertainment, including dancing lessons, face painting, treasure hunts, Spanish lessons, and much more. With XBox and Wii video games, a kids’ pool area, and an indoor arts and crafts area, kids are always on vacation at Beach Palace. For teenage guests there is an XBox 360 and video games tournament on the giant screen. The friendly and helpful staff will make sure your stay is nothing short of phenomenal. A family vacation is so much more rewarding and worry-free when you visit the all-inclusive Beach Palace. Whatever your pleasure, you and your family can enjoy it with absolute freedom, from unlimited food and beverage to nightly entertainment to 24-hour room service. Even your long-distance calls and all of your taxes and gratuities are included in all-inclusive features. As a resort that caters to couples and families alike, couples with children can take advantage of the Family Connections program to make sure everyone in the family has a fantastic time. Delightful dishes from all over the world await you at Beach Palace Resort. 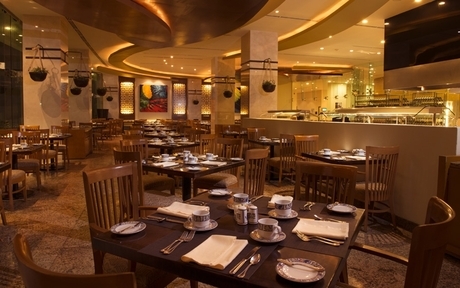 From Pan-asian, Mexican, Italian and International specialties, your palate will thank you. 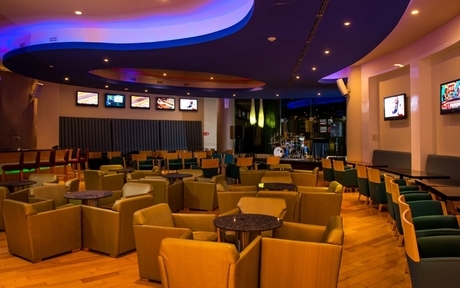 Toast to the good times with a wide variety of beers, wines and spirits. They serve top-rated wine by the bottle from around the world. The 24-hour room service is ready to serve you in the comfort of your luxurious guest room. A wide selection of breakfast favorites, entrees and main courses, soups, salads, snacks and desserts, are all available 24 hours a day. ALL INCLUSIVE FEATURES: Luxurious accomodations, fine dining, delicious snacks, top-shelf drinks, 24-hour room service, non-motorized water sports sensational entertainment, wireless internet, unlimited phone calls*, 30 minute use of internet sevice**, taxes & gratuities. credit to pay for rounds of golf, spa experiences and all sorts of other stuff on the resort. There’s no need to reserve anything in advance, just visit the Palace Vacation Planner desk when you arrive to plan your activity or get ideas. When using Resort Credit for Vacation Memories, Resort Credit Shop, and other products and services offered as part of this promotion, 16% service fees will apply. These taxes and fees can be paid with cash, credit card or other authorized means. Remaining Resort Credit cannot be used towards Spa. Resort Credit is subject to change without notice. Restrictions Apply. Children 0 to 3 years of age stay free. Child Fees are due at check in and will have to be paid directly to the hotel. Kids and Teens Stay FREE! Kids up to 17 years of age stay free of charge with one accompanying adult on minimum stays of 3 nights. You also receive a resort credit of $1500 to experience the destination with amazing tours, swim with the dolphins, and so much more. Book now and Travel until December 23rd, 2018. Blackouts apply from December 24th, 2018 thru January 3, 2019. In the event that any Palace Resorts is directly impacted by a hurricane(1) while you are on vacation, the property will gladly offer a certificate(2) for a return stay to the original resort for the number of unused nights(3). Cancellations: If a hurricane warning is issued by the US National Weather Center, any passenger due to travel within 72 hours of the warning will not incur a penalty for rescheduling their vacation. Please contact your customer care representative at the number provided on your communication receipt if you wish to reschedule your reservation. No show: No show penalties will also be waived from the day a hurricane warning is issued by the US National Weather Center, and up to 5 days after normal activities are reinitiated at the hotel. Early departures: In the event of a hurricane threat, guests that are currently on property who wish to depart early, may do so without incurring an early penalty and will receive a certificate for the number of unused nights, valid for travel within 1 calendar year of original reserved dates. Relocations: In the event of a hurricane, guests have the option to transfer their reservation to an alternate Palace Resorts destination that is not within the storm’s projected path (except Le Blanc Spa Resort Cancun or Los Cabos). Rooms will be offered at the same rate based on availability. In the event that rates are lower at the relocating hotel, a credit for the difference will be issued, property cannot guarantee room category and will not issue return stay if this option is used. Reschedule: If guests wish to postpone their vacation and travel at a later date, Palace Resorts will guarantee original rate for travel within calendar year. Guests wishing to utilize this option must reschedule their trip within 30 days following a storm. Blackout periods may apply. Rate protection will only apply to the number of original nights and number of guests booked. Additional nights or guests will be booked at current rate. No name changes allowed. (1) Policy will go into effect once the US National Weather Center issues a hurricane warning to the area and the hurricane directly hits any Palace Resort. (2) Certificate will be valid for travel within 1 calendar year of original reserved dates; it is nontransferable, not redeemable for cash. Space is subject to availability and blackout periods may apply (3). Excludes day of departure, airfare and transfers are not included in Mexico. No upgraded categories. All other terms and conditions listed on certificate apply. 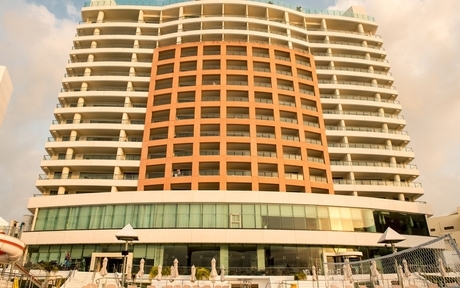 Beach Palace Mexico is the best Cancun lodging choice for your trip to Mexico. 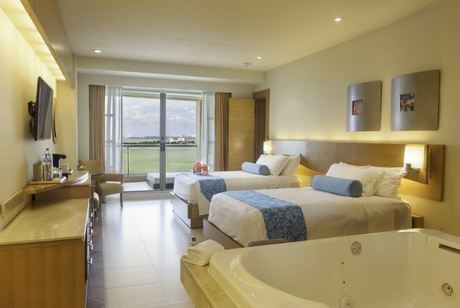 With numerous amenities for guests such as room service, car rental, children's play area, you will wake up at Beach Palace Mexico feeling invigorated every day for your time in Cancun. Don’t let this amazing reservation opportunity pass you by, book your stay at Beach Palace Mexico today to make the most of your time in Cancun, Mexico.